The content of this blog-post was presented during the keynote titled “Success Favors the Prepared Mind”, I delivered last Friday (June 21, 2013) at the 2013 Endeavor Entrepreneur Summit, in San Francisco, California, USA. What makes Silicon Valley unique? Does the Valley’s success lie in its geography or in the mindset of the people who live here? While many of my posts focus on the Valley as a model to learn best practices and emerging trends, today’s post picks up the historical perspective of an earlier post published exactly one year ago — on June 29 2012 (https://carlosbaradello.com/2012/06/29/mining-the-silicon-valley-mind-a-perspective/). In this post, I share the ten attributes, which emerged over the past century and a half, which help to explain this region’s dynamism. Today, I expand on a new perspective on the required characteristics of today’s arriving foreign entrepreneurs to be effective and seize the opportunities that Valley offers. I don’t believe it is Silicon Valley’s water or air that makes its people more creative, innovative or entrepreneurial than others. Instead, I’d like to share my perspective that the Valley’s entrepreneurial mindset has been 165 years in the making. In fact, this mindset has roots in Northern California’s infamous Gold Rush in the mid-19th century. The early West Coast of the United States was largely inaccessible to the rest of the world. It was a harsh continental landscape away from the established East Coast, vast oceans away from Asia and Europe, deserts and mountains away from its even closer neighbors in Latin America. As a result, Northern California remained sparsely populated and isolated from the rest of the world for a long time, and people did not consider it worth the trouble to “Go West.” However, all this changed when gold was discovered in 1848. 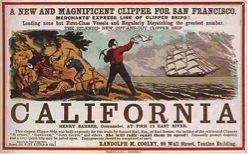 Northern California’s Gold Rush started in 1848. Among the first to hear news of gold were people in East Asia and South America, and many chose to immigrate. Interestingly, these migrants’ motivations were very different from that of migrants who had arrived from Europe to the American Northeast two centuries prior. While the Mayflower Pilgrims came to the New World seeking the political or religious freedoms denied to them in Europe, migrants to Northern California fundamentally sought economic rewards. The personality profile of Gold Rush migrants consisted of two key attributes: (a) a natural self-selection of risk-takers willing to migrate over vast and harsh terrains, and (b) a no-nonsense desire for economic rewards. As a result, the region’s DNA was self-selecting: people who chose to “Go West” were overwhelmingly risk-taking, adaptive, flexible, tolerant of discomfort, and even ready to die in their pursuit of economic prosperity. Seen through another lens, these migrants in fact were quintessential entrepreneurs. These gold-seekers, called “forty-niners” (in reference to the year 1849, when immigrants arrived in large numbers), often faced substantial hardships on their journeys to get here. Once they arrived, they faced mining accidents, diseases, and in many cases, death. Today’s foreign entrepreneurs mimic certain characteristics of the gold rush migrants of the 1800s. Instant broadband communications keep foreign entrepreneurs connected to the Valley prior their arrival and keep them connected to home upon their arrival. 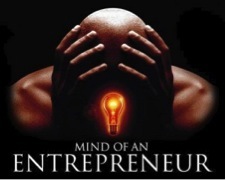 What is the mindset required for an entrepreneur to be World Class? The unique characteristic of this rugged, dangerous and isolated terrain had an enormous influence on the early settlers of the “Wild West.” I have concluded that the key attributes of the Gold Rush mindset can be summarized with 10 key characteristics that capture the spirit of the early settlers. Interestingly, these characteristics are not in isolation. They have much in common with the enabling characteristics of the 21st century’s Silicon Valley mind. Furthermore, I have added a third column to the original mindset table published one year ago. This column addresses the required characteristics of the foreign entrepreneurs today to fully benefit from Silicon Valley’s resources and opportunities. You will be transformed from a big fish in a small pond to a very small fish in a very large ocean! The Valley is open for business 24/7/365, are you? Be able to develop win/win relationships with the supporting stakeholders. You need all the help you can get! Know your stuff; you will not be able to fake it! The things you do not know, admit and learn quickly. Get plugged in to the key information avenues either by networking or reading the right web sites/blogs. You are creating your track record, success or failure, how you conduct yourself is important. Master its delivery under ALL circumstances. Mentors could be an incredible asset, find them and use them! Hundreds of ecosystems pursuing innovation and entrepreneurship are sprouting up throughout world, and each one is seeking to create its own color and texture, learning from one another and improving and adapting the Silicon Valley model to local characteristics, norms and codes. Most have wisely given up any effort to replicate Silicon Valley after recognizing that the Valley could not replicate itself even if it wanted, since the conditions that fostered its creation are impossible to replicate! Without a doubt, though, gears are in motion to create such a “Global Valley”. However, this will take probably decades — note that SV construction did not happen overnight – in the meantime globally minded entrepreneurs will seek to come to the Valley, as actors dream to go to Hollywood or athletes crave to participate in the Olympics. What do you think? Do you agree or disagree? Let me know, especially if you disagree! Until my next post. – Carlos B. In my posts I often use three terms, Silicon Valley (SV), the Valley, and the San Francisco Bay Area (SFBA) or simply the Bay Area interchangeably. Adapted from The Silicon Valley Edge, Edited by Chong-Moon Lee, William F. Miller, M. Gong Hancock, and Henry S. Rowen, Stanford University Press, 2000. This is the personal perspective of the author. In 1861, the telegraph connected San Francisco to the East Coast enabling cross-continental businesses and news-share; however, it had to wait until 1869 when the railroad connecting both coasts was completed to trigger the physical integration process to the USA. Still, the ten attributes described in the table below were so deeply rooted that continued to evolve becoming a distinguishing characteristic of this region. This is not part of today’s 10 key enabling characteristics shown in reference 2. This entry was posted in My posts and tagged entrepreneurship, foreign entrepreneurs, gold rush, innovation, pitching, Silicon Valley. Bookmark the permalink.